I think it’s fair to say that football isn’t my World Cup of tea. Still, the remaining Jaguar library isn’t going to review itself, and the current timing makes this as good an excuse as any. Plus, Fever Pitch is a fairly loose version of the sport. 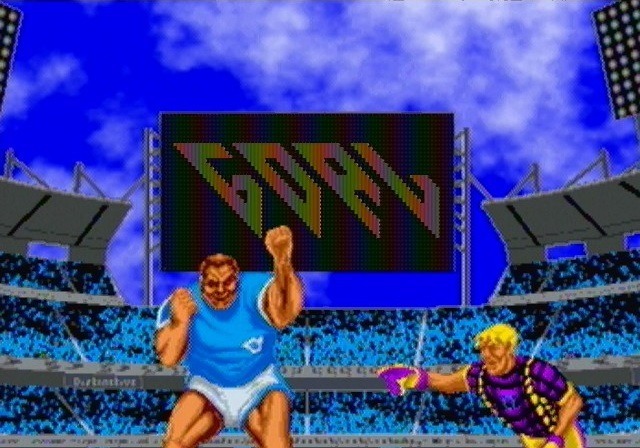 This is football done “dirty,” in the same vein of Arch Rivals and NBA Jam. 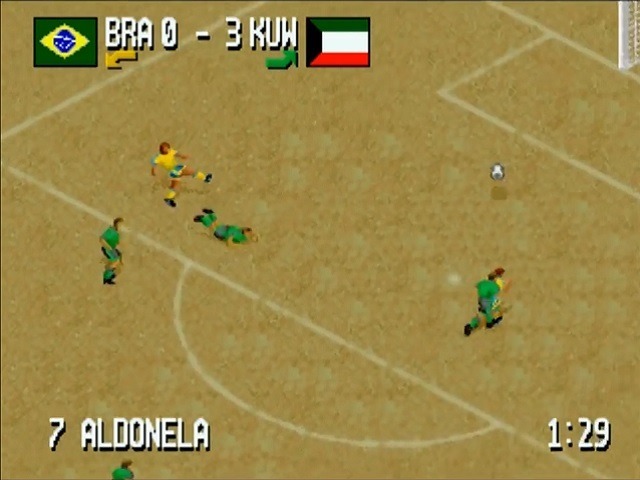 The same button that kicks the ball can be used to kick your opponent to the ground, and the manual makes many a joke about bespectacled “Richard the Referee” being slow to move about the field and generally terrible at his job. Unfortunately, Fever Pitch’s brand of fast arcade action doesn’t seem to fit football as well as other sports. You can’t see downfield, but it’s a bit easier to aim than in FIFA. 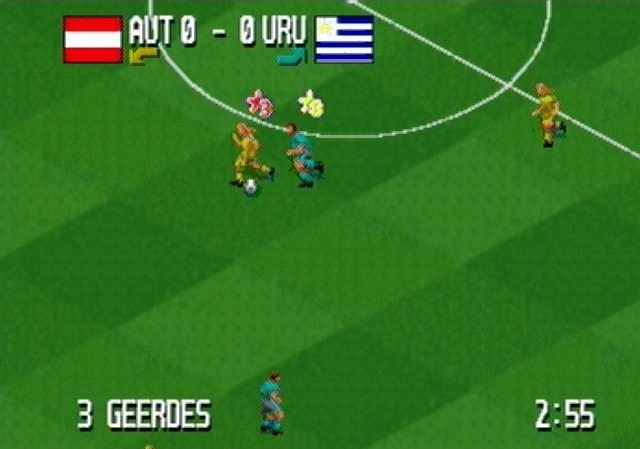 Fever Pitch Soccer (called Head-On Soccer in the U.S. for its Genesis and SNES release) is a basic port from the 16-bit versions. There’s little reason to play on the Jaguar, with the exception being a seemingly-increased resolution. The camera feels pulled back a little further, the textures a touch sharper, but overall, this experience is on par with the other consoles – no 64-bit magic here. 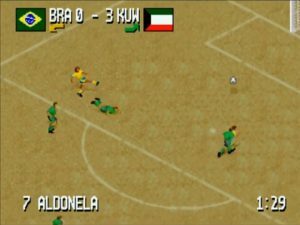 The audio is especially painful and limited overall, with only whistles, grunts, crowd noise, and a single noise for kicking the ball that sounds like a hit out of the NES version of Double Dragon. Every. Time. You. Kick. Gameplay is cut down to just the basics. On offense, A will pass to the nearest player in the direction you’re facing, even if they’re off screen. B kicks. You can certainly “pass” the ball by kicking, but using A takes care of the actual aiming. Likewise, A is generally a softer kick, but I’ve still scored goals with it. I like this looseness, and it helps charging up the pitch feel organic. Ball physics are great too. The ball somewhat snaps to the player dribbling it – it doesn’t feel magnetic, and it can certainly miss its intended target or otherwise get away from you. I’ve even had the keeper’s attempts to block a shot instead tip the ball into the goal in ways that felt natural instead of cheap or unfair. On defense, A does a sliding tackle and B kicks. You can also use B to head when the ball is in the air, though you’re not helped with the aim here, so it’s a bit flaky in practice. While traditional rules of conduct are present, the rate at which they are enforced is incredibly low by default. Yellow and red cards make scarce appearances, penalty kicks are rare, and overall, you can punt and slide to your heart’s content. Injuries to you or your opponents are not modeled. There are no other players in your roster beside your starting 11. Kicking an opponent just knocks them down for no more than a second, and so is really only useful to strip the ball. If the ball goes out, you will have traditional corner kicks, throw ins, or directly control your keeper (the only time you do so) to toss it back in. Hey dipshit! Down there! You wanna come help me out here? At least patrol the edge of your zone? Something? Anything?? Things start to break down when trying to manage the players. C, on defense, will switch to the player nearest the ball. However, this also happens automatically if your current player falls too far behind. Usually this is a nice feature, but it’s never clear when you’ll switch, or whom you’ll switch to if two players are roughly the same distance away. Practically, this led to situations where control would suddenly jump to the next player in position to intercept, who promptly turns tail and runs away because I’m still trying to control the guy who was giving chase. I’ve scored goals on myself this way, as control (and the buttons) suddenly change to a new player. With no way to see where your other teammates are off-screen, using C to switch manually is often a liability. Another frustration – your teammates rarely do anything. 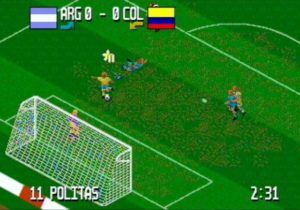 As the screen scrolls, you’ll see them frozen and waiting to be triggered, sometimes after the ball has passed them completely. Occasionally an AI-controlled player will automatically move to converge on the ball (switching to your control upon the steal) but what triggers this inspiration isn’t clear or reliable. Instead, there’s usually long strings of individual players chasing after the ball, with nothing I could call coordination. Your AI opponents seem well coordinated by comparison, and to further sting, the AI always seems to steal any leads away. It’s difficult to prove rubber-band AI definitively, but this game certainly reeks of it. You can straight up punt a dude without expecting retribution. This wasn’t fun for me, and really just felt like an overly elaborate game of foosball. As said, the AI on your team seems to default to zones, standing stock still until triggered, and taking no initiative to place themselves to intercept the ball. You can’t control your team’s direction (offense, defense), and you can’t rely on them to be standing somewhere useful, so forget about setting up strategy or plays. This is not the kind of game where a striker hovers in wait to instantly redirect a slick pass into the goal. The best thing going for you is that there’s usually someone upfield to pass to… somewhere. You can play a quick exhibition match (the only place where two player is allowed), but the real game is the Tournament. You’ll pick from one of 51 teams, then have to beat 28 of them in four continental divisions. Along the way, you’re earning credits based on your performance. If you’ve performed well enough, you gain the ability to spend those credits on star players. These guys are special performers with arcade-style abilities. You have the guy who can hold the ball with his ankles while hopping over a defender’s tackle. You have a burly enforcer who bowls over other players. You have the “cheater” who fakes injuries to draw penalty cards. You have the shooter who kicks the ball so hard it trails fire. Star keepers and passers have superhuman reflexes and accuracy. This is also the only place a red card matters, as a lost star player is replaced with a random nobody. team didn’t want these guys to be little man-shaped specks on the field. Some nice interstitial screens appear whenever there’s a goal, but these get repetitive. 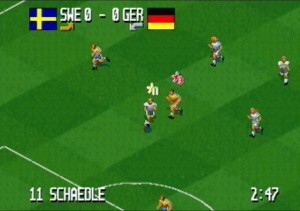 You also have the ability to control a replay of the last goal, with the B button even advancing frame by frame. Both of these can be turned off in the options menu. The ball’s coming right at him and my teammate isn’t even looking. 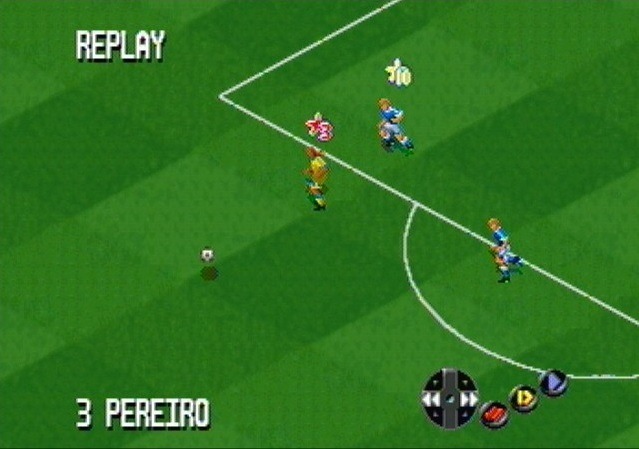 Watching videos of FIFA 95, I think this game’s biggest problem is its viewing angle. The mostly-overhead perspective means you really can’t see what’s coming down the field. It’s impossible to see where you should pass to, and difficult to move out of the way of an oncoming opponent. There are no arrows or indicators of where your teammates are off-screen, which seems like a huge oversight. Further, you’re going to have a hard time spotting your star players. They have distinct sprites, but at speed, you’re going to have to go by remembering their number. I also don’t like that every player has the same default stats. Star players and any special bonuses aside, every player runs at the same speed, kicks with the same accuracy, and maintains the same control over the ball – which is to say, none. You get a “lite” version of the enjoyment of building up your team, but it feels lacking, and especially when the speed and limited view upfield means you’re struggling to play the game as is. Finally, I should mention I never won a match. This, and my inexperience with other football games, makes me feel supremely unqualified to publish this, and you should probably ignore the star rating entirely. Still, I hate to see the work go to waste, and hopefully I’ve explained my issues here well enough. I sincerely hope someone comes along and tackles either the SNES or Mega Drive versions, mostly because I’m curious if they play any better. Someone with more of a grasp of sports games, European culture, and what makes a decent football title. Someone… but who…? Overall, I found Fever Pitch’s arcade focus a disappointment. 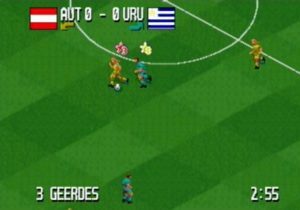 The beautiful game doesn’t seem to translate to an arcade “dirty sport” as well as Arch Rivals or Mutant League, and while you can turn rule enforcement back on somewhat, the base game is still too chaotic to be really enjoyable. Your limited view doesn’t help either, and stacking your team full of superhuman players isn’t as much fun as it sounds when your opponents are doing the same. 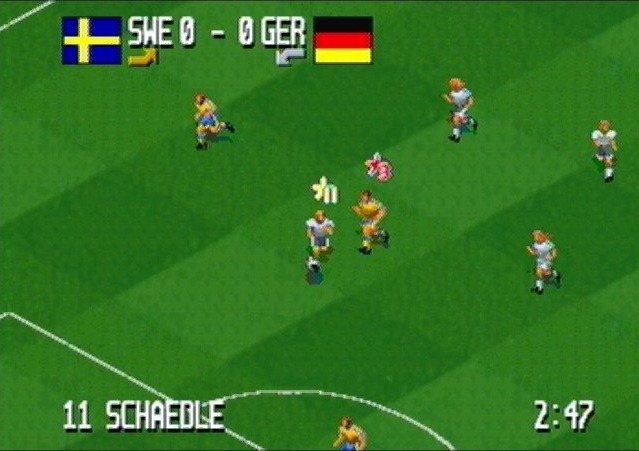 Instead, you can turn rules off in FIFA ’95 and have a similar experience, with a better core game to boot. Games are quick to get into and don’t require deep strategy. Somewhat fun to to get aggressive, and the star players’ abilities add some fun (especially being able to curve the ball impossibly in midair). Does support the Pro controller for triggering star players’ special moves. Restricted view makes it difficult to see what’s coming. Strategy not needed, but no ability to have any either. Too fast and reckless for my tastes. Can’t save to the cart, and instead must use a 13 character password. I thought this game looked familiar at first, but seeing the post-goal shot with the big guy with the “HURR DURR I IZ GOAL!” look on his face clinched it. I’m glad you decided to go ahead with this review, JMan! I know you were hinting to your colleague, but before Dave joined I did consider a tentative offer of some guest football and/or cricket reviews for JGR. In the end I think my lack of 16-bit console expertise dissuaded me from doing anything more than thinking about it. Plus I guess it would have detracted from my quest to be grumpy about all the old PC football games I bought and didn’t like! Well, you’re always welcome to if you change your mind. I’m sure it would be worlds more insightful than me comparing one football game to another one I saw on YouTube. Well you have Dave now!